Th name of an imported mesh in SL is taken from the "name" attribute of the <geometry> tag defining the mesh. 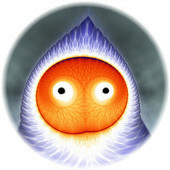 Im Blender 2.49b, the exporter took this attribute from the Blender object name. Unfortunately, in Blender 2.63 it is taken instead from the data block. This means that renaming your objects so that they have reasonable names sfter import is no longer effective. Instead you have to rename the data blocks. You can do that in Outline view or in the property editor for object data (the inverted triangle of vertices). If you use the same datablock for multiple objects, the exporter uses instancing, with the geometry appearing only once in the collada file, referenced in multiple nodes of the scene, each with their own transformations. Unfortunately, the uploader does not use instancing (although it does reads it properly from the collada). Instead, it ulpoads separate meshes. Since only one of these can use the dtablock name, the others appear to be renamed to "Object". 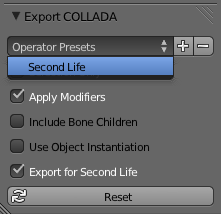 Note that most probably we can replace the "Export for Second Life" button label by something that explains better what really is going on. The function behind that button has most probably nothing to do with Second life at all, but with an alternative way to export armatures. Hi Gaia, thanks for the information. If you are working on the exporter... would it be possible, that the checkbox-settings for the exporter get memorized? What you request will be available for blender 2.64. As long as you keep blender open, it will memorize the previous settings. This has been implemented for all operators. Only when you restart blender the settings reset to the defaults. If we find any issues, should we report here or at Blender's site?